The sun made a brief appearance today and the light was just right to take this picture. 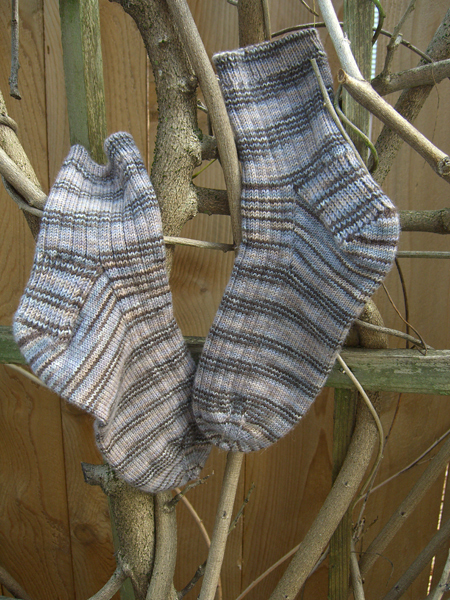 The Downpour socks are posing on my wisteria, bare in the winter chill. The colors are perfect to set off the stripy gray and brown and taupe of the yarn. It’s fitting that these were knit during the wettest November on record in Portland. And look! No pooling! It’s a miracle. The stripes do get thinner over the gussets, but it’s not unattractive. The stripes are much wider on the ankles than on the feet, even though there is the same number of stitches around and my gauge remained constant. The only difference is that the ankles are ribbed all the way around. They are a little shorter than I usually like to make socks. But since I knit until I ran out, it’s as long as they can be. Yarn: Socks That Rock ( 100% Superwash Merino/ 4.25 oz, 350yds per skein) in colorway Downpour — all of one skein. Pattern: My own toe-up ribbed guy’s socks. I used heel stitch on the heel flap. The top of the foot and the ankle are knit in K3P1 ribbing. Not thinking what I was doing, I missed on the heel stitch and ended up with the ridges matching up to the purl stitches in the ribbing. I decided I liked how it looked – it made the ribbing stand out – and when I started the K1P1 ribbing at the top I offset it from the ribbing on the leg. When I started the ribbing on the toe, I started with the purl stitches in the middle first and then each row I started a new purl rib at the next spot away from the center. So the start of the ribbing follows the curve of the toe, if that makes sense. It’s not a good idea, it turns out, to pose socks or other knitted items amongst roses, even though the drying rose hips looks so cheery. Roses, it turns out, have thorns and thorns can snag yarn (and fingers) and lead to time spent carefully rearranging loops of yarn. Just saying. I have started the next pair of socks. You may note from the progress meters that they are chartreuse. I am saving pics for later posts. I gotta have something left over for blog fodder! I LOVE your snow video. How did you do that (post it)? its great. I took the film clip with my camera, which stores video as an .avi file. I converted the .avi to an .flv, reduced its size, and uploaded it. Then I used Joshua Eldridge’s Flash Video Player plugin for WordPress to display it in the little flash player. It took me about 10000 times as long to figure out how to do it as it did to write it down in the above paragraph. You may have noticed a couple of days where there was a dearth of blogging? Picture me, seated at my desk, swearing…. I know I can get this blasted thing to work! Finally, I saw this at ~Kristie’s blog, and I just had to post my results because they were so right on!